It assumes non-OPEC production will rise by 2.5 mmbd from 2017. 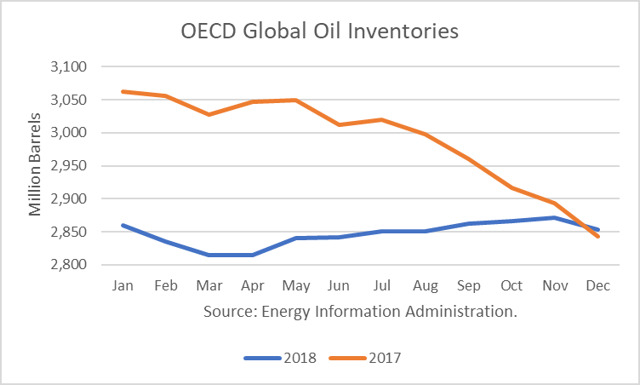 The International Energy Agency’s June outlook calls for demand rising by 1.4 mmbd in 2018. But it also projects a lower growth in non-OPEC production of 2.0 mmbd. On a net basis, the two forecasts are about the same. Based on the latest reports, Saudi Arabia and Russia are discussing lifting output. Iran and Venezuela oppose any output increase. But they could do so and still remain true to the OPEC+ deal, which put OPEC’s ceiling for the current members at 32.7 mmbd. May production was estimated at 31.93 mmbd. Russia reportedly wants production ceilings to be lifted to their October 2016 levels. President Putin has said $60 oil suits Russia, which would mean WTI around $55/b. President Trump has repeated his tweet that oil prices are too high. The Saudis depend on the US for their security and want help transforming their economy. They really have no choice but to appease Trump. Two wild cards are Venezuela and Iran. Venezuela needs help stabilizing its production, and China and Russia may be able to help them. It is unclear to what extent Iran’s production will drop if new sanctions are imposed. It is also possible they will give in to Trump’s conditions, and sanctions will not be imposed in 6 months. If Venezuela’s oil production continues to plummet, the U.S. does have the option of drawing down the Strategic Petroleum Reserve to replace the lost production. This would avert a super-spike in prices. The SPR has 660 million barrels and could supply up to 4.0 mmbd, so there would be no problem replacing Venezuela’s production of about 1.5 mmbd over the short-to-medium term. I expect OPEC to announce at its meeting that it will increase its production back to the 32.7 mmbd ceiling over the coming months. I also expect that it will assure consumers that it will maintain that level should there be further outages in some member countries, referring to Venezuela and Iran. I think u have it about right barring who knows what. US now producing 10.9 m boe soon to be 11m I don’t think anyone wants price spikes. Trump has complicated things a lot also when Permian pipeline(s) r completed late 2019 more oil will be flowing out. Daniel Yergin expects Permian production to double in 5 years to 5.4m boe. As the Chinese says we r living in interesting times boy r we ever!